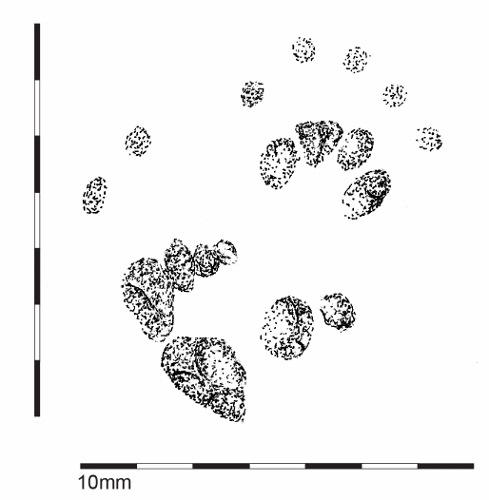 You will mostly only see possum forefoot prints on tracking paper because possums are too big to fit in standard tunnels. If you do find fore and hind footprints, then the hind foot will be placed just behind (or slightly overlapping) the forefoot on the same side (e.g. both are left feet). The forefoot cushion pads are in four or five sections. The dots around the front are toe pads and are 1 to 1.5 cm away from the pads. Five or six cushion pads on the hindfoot might be visible. The cushion pads of the 2nd and 3rd digits are fused (called syndactyly toe). The toe pad of the ‘thumb’ is usually visible and one or both of the 4th and/or 5th digit toe pads. The toe pads for the 2nd and 3rd digits may or may not show, but are not fused.